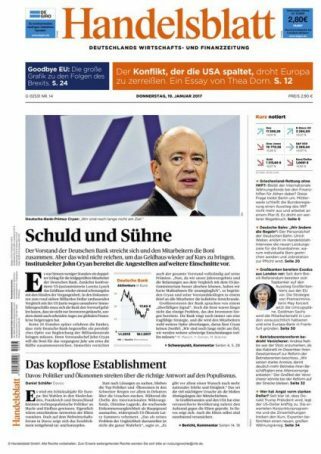 Handelsblatt is the only business and financial newspaper in Germany and a byword for up-to-the-minute information, reliable research, serious journalism and objectivity. News is researched, analyzed and placed in its often complex context. Particular importance is attached to background, commentary, analysis. With its expertly researched reports on future trends and new technologies, Handelsblatt supplies decision-makers with the information they need to act successfully in constantly changing sectors and markets. 282,000 decision-makers read Handelsblatt every day (LAE 2016 survey). Approx 84% are self-employed and management executives, more than half belong to the 1st or 2nd tier. Moreover, Handelsblatt is the most cost-efficient advertising medium of all the national newspapers in these important target groups and also offers outstanding value for money in other relevant decision-maker target groups. 33% of the readers have an annual gross personal income between 80K to 100k Euros. And 23% between 100.000 to 150.000 Euros.